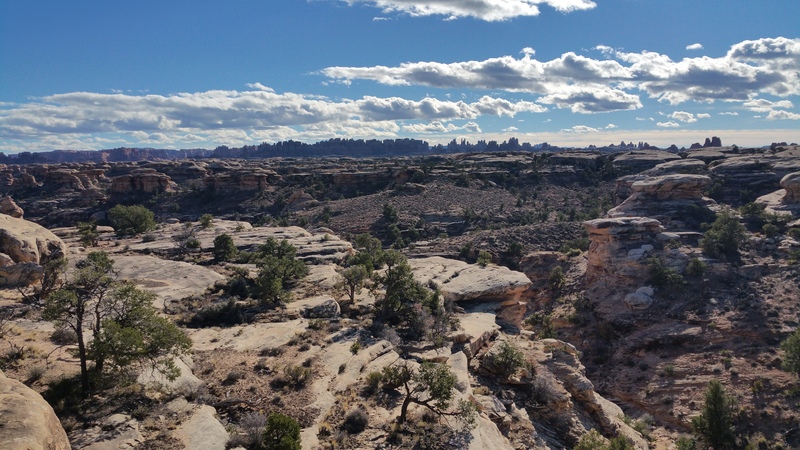 I should have explained in my first post about Canyonlands that the national park is divided into three districts: Island in the Sky, Needles, and The Maze. 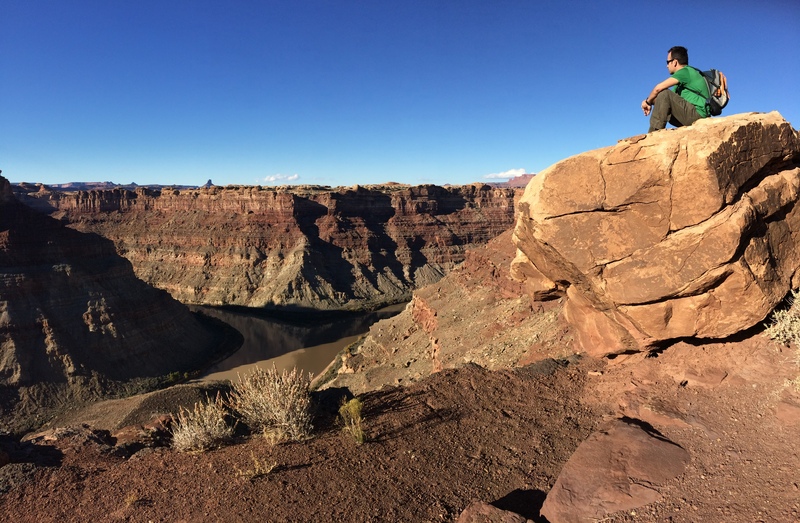 These three districts are separated by deep canyons created by the Colorado and Green Rivers, making it impossible to go from one park to the other within national park boundaries. Each district has its own entrance, which takes at least a couple of hours to travel from one to the next. 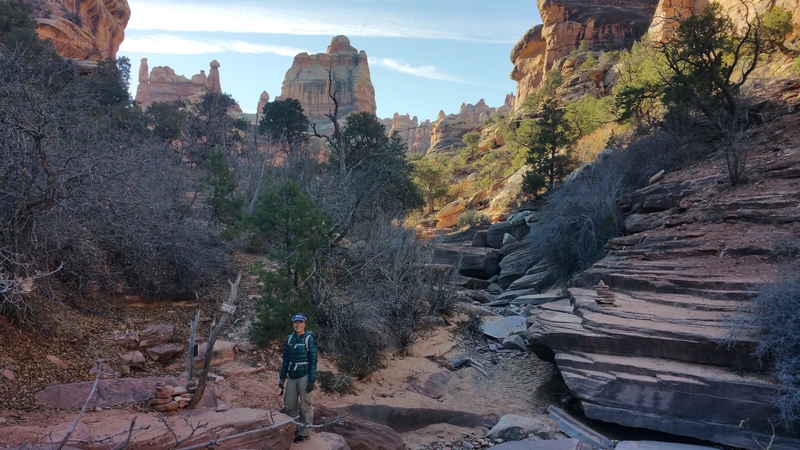 Last year during my first visit to Canyonlands, I sampled two days at Island in the Sky by checking out every overlook, walking all the easy trails including sunrise as Mesa Arch, and hiking the Upheaval Dome and incredible Gooseberry trails. 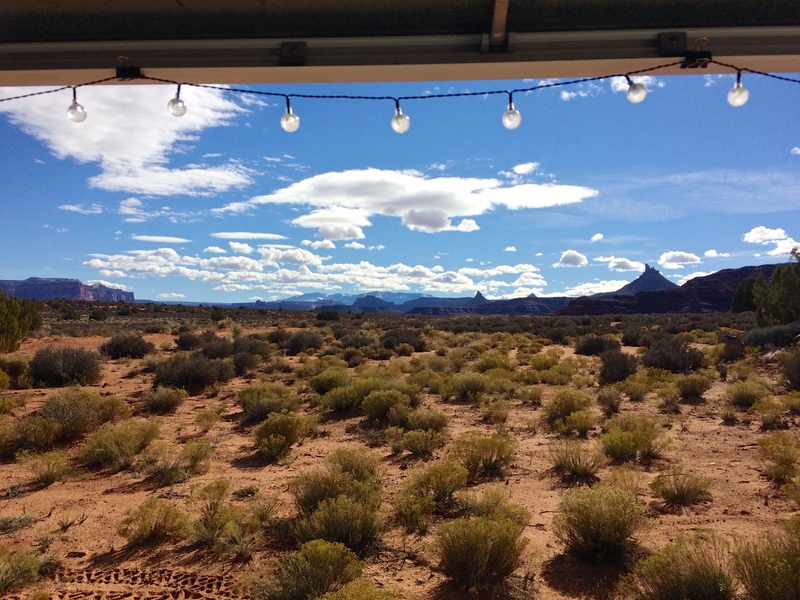 This year the plan was to consume more of what Canyonlands had to offer at not just Island in the Sky but also Needles. For those with limited time, Island in the Sky should be visited for its majestic overlooks and variety of short to long hikes. 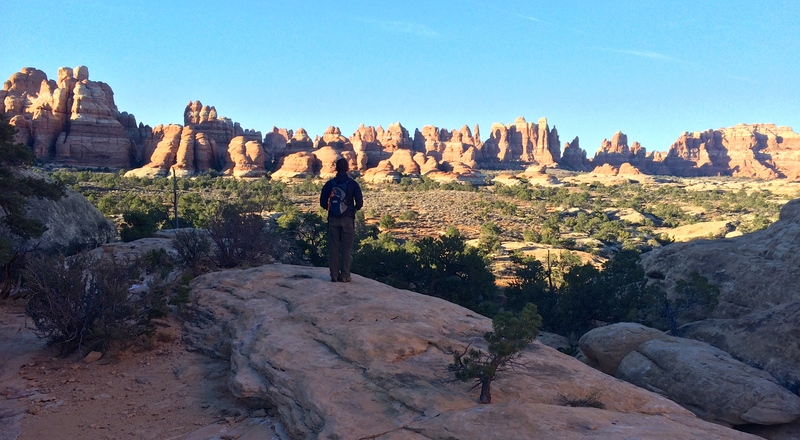 Needles takes it up a notch; in addition to the epic panoramic landscape of rock spires, there are countless combinations of hiking trails and backcountry camping. And finally, The Maze. Perhaps someday when I’m thirstier for adventure (and equipped with a more suitable vehicle) I’ll brave the Maze which is the least accessible district and is entirely made of wild, rugged roads and landscape. This time around we visited Needles and revisited Island in the Sky. Due to Chris’ work schedule we had exactly 24 hours for Needles, and we definitely made the most of it. As far as free camping went, there were campsites (paid and dispersed) conveniently located on BLM land not far from the Needles entrance. Hamburger Rock was an adorable campground with a $6/night fee, but all the campsites surrounding it were free. 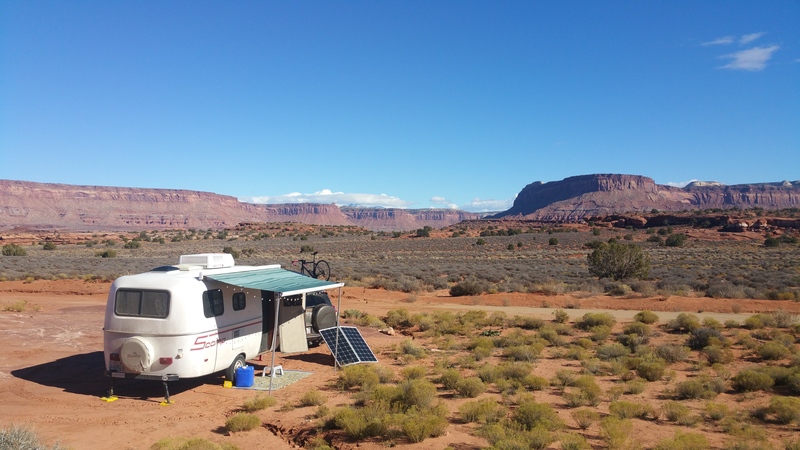 By sunrise we departed Mexican Hat Rock, and after running errands and what not, we finally unhitched Scromp at a dispersed site before noon. Once we entered the park we beelined it for the Big Spring Canyon Overlook in order to hike the 10-mile trail to the Confluence Overlook. We did make a quick stop at the Wooden Shoe Arch Overlook. With winter dictating an early sunset, we knew setting out by 1pm was a must. Off we went into a valley of rocks and formations. Unlike most trails in Needles, the Confluence Overlook trail was quite exposed and separated from the Elephant Hill area. Being distant from the rock peaks granted us spectacular views from afar; the silhouette of the needles resembled an enchanted kingdom one stumbled upon after days of relentless travel through lifeless deserts. By the time we made it to the Confluence Overlook the long shadows of winter had already stretched across the Colorado and Green Rivers, but the muddy concoction of both rivers was still evident. It wasn’t long before we set back out again, as it became a task to beat the sun. Thanks to the easy hike, it only took about 4 hours round-trip. The following day was jam-packed with fun and logistics. 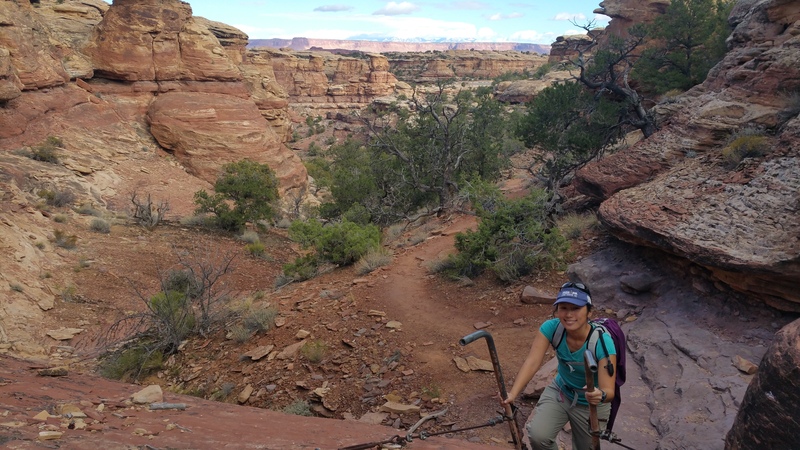 Our agenda included the 11-mile round-trip hike to Druid Arch, restocking our water supply, acquiring a permit to drive the 100-mile White Rim Road, stocking up on groceries, and finishing the day by overnighting near the Island in the Sky district. Again we got up before sunrise in order to hit the trail by 8am. 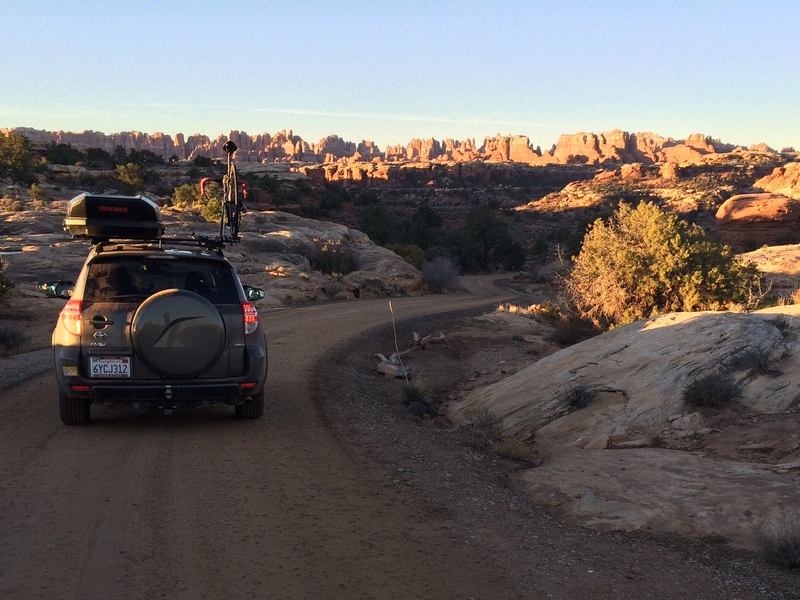 As we drove into the park, the surrounding canyons glowed pink, and by the time we set tracks on the primitive road to the Elephant Hill trailhead the early sunlight had just begun to spill over the needles. Like I mentioned earlier, seeing the panorama of needles from afar on the trail made me feel as if I was just outside the boundary walls of a kingdom. And once in the kingdom, it was a whole new magical world. 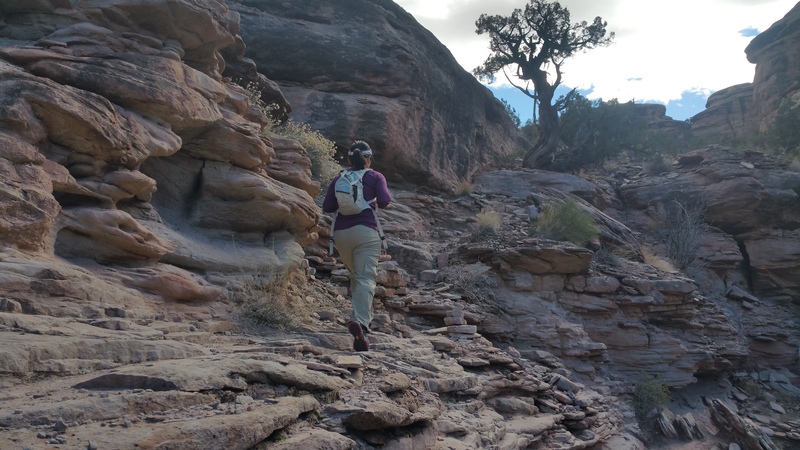 Criss-crossing through dried-up creek beds, scrambling over and down rocks, keeping an eye out for cairns, and playfully throwing stones into lightly frozen puddles became the typical affair throughout the course of the 11-mile hike. At its final rock scramble, we were rewarded with the looming Druid Arch. Druid Arch was much bigger than it appeared in photos. After lunch and several shouts into the echo chamber surrounding us, we backtracked to the trailhead. It took about 4.5 hours to complete the hike. The next half of the day was an eventful blur. We filled up on water at the year-round campsite in Needles, purchased a permit for the 100-mile White Rim Road off-roading adventure for Island in the Sky at the Needles Visitor Center, broke down camp and drove into Moab, stocked up on groceries, and made it to our next campsite for the night just outside of the Island in the Sky entrance. I was happy. 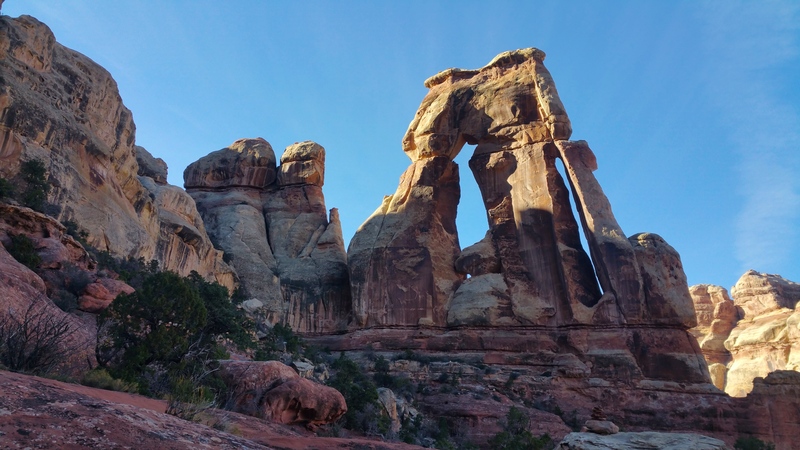 Having only spent 24 hours in the Needles District, I was amazed we were able to squeeze in two epic hikes to the Confluence Overlook and Druid Arch. Interestingly enough the real fun would begin the next morning on the White Rim Road in Island in the Sky. 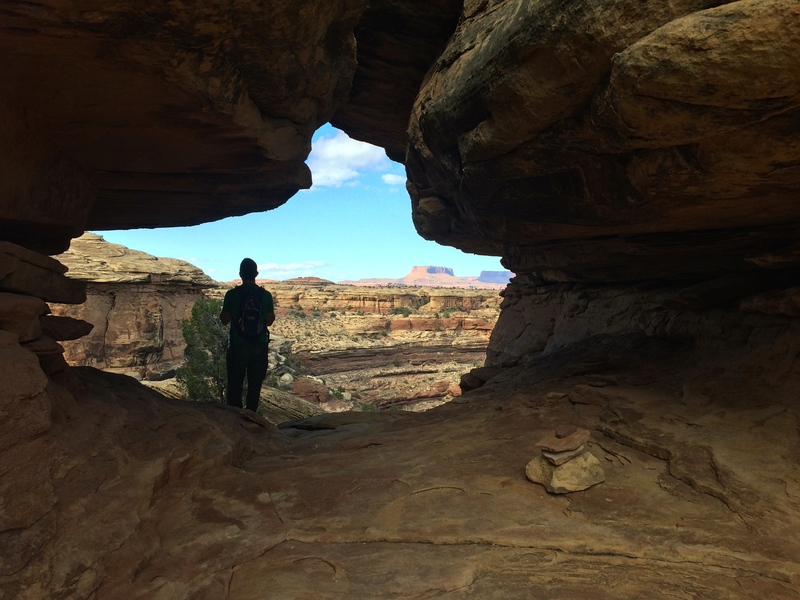 This entry was posted in Utah and tagged confluence overlook, druid arch. Bookmark the permalink.